Heading South from Catania, the landscape starts to change: from the mountains and the cliffs of a volcanic area to low and gentle hills filled with vineyards as well as carob, almond and olive groves, kilometre-long sandy beaches as well as beautiful awe-inspiring towns rich in invaluable monuments and landmarks. The Noto Valley is the cradle of the most outstanding evidence of Sicilian baroque, which is why 8 historical centres in the area are UNESCO World Heritage Sites. If you are planning a visit check out one of our villas in Val di Noto for your stay. 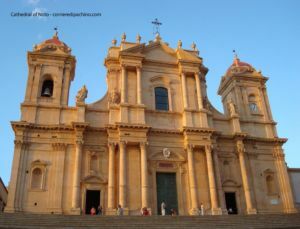 Noto, not far from some of our most beautiful historical villas in Sicily, is considered the Capital of Baroque, and it’s really not hard to understand why. A strong and florid city in the Renaissance, it was completely destroyed by the devastating earthquake of 1693, leaving just what is now called “Noto Antica”: the new city was built a few kilometres from the former settlement, and great architects and urban designers, all major representatives of the typical Baroque architecture of that time, were asked to contribute to the re-building of Noto. The new plan of the city was divided into two sections: one would house the district of powers (political, religious, military) and the other one would be the area of the middle and lower classes. The result of this impressive work is still astonishing. You’ll perceive it as soon as you start walking through Corso Vittorio, the main avenue of the historical centre: magnificent, jaw-dropping works of art of the most typical baroque architecture are wisely spread along the road. The whole plan of the area is structured with an almost perfect symmetry; the golden stone of refined palaces creates an enchanting atmosphere both during the day, when it reflects the sunrays, and during the night, when a soft amber lighting enhances the beautiful dreamy atmosphere. The Churches of San Francesco all’Immacolata, Santa Chiara, San Carlo, San Domenico; the Civic Museum, the town theatre, the Palazzo Landolina – and then of course the outstanding Cathedral: all these buildings, rich in lavish decorations and round shapes, are an invaluable, extraordinary evidence of Sicilian Baroque at its best. Scenic squares, huge staircases connecting the different levels of the city (set on a steep hill), lovely flowery terraces and sinuous wrought-iron balconies (some say, the most beautiful in the world): a visit to Noto is just mandatory. And if you happen to be around in May, don’t miss the “Infiorata”: Via Nicolaci is filled with wonderful floral works of art. Other UNESCO World Heritage Sites, with wonderful baroque historical centers, can be found in the area: Palazzolo Acreide, with plenty of other great evidence of the luxurious patterns and design of Sicilian baroque, especially in Palazzo Pizzo, Palazzo Zocco, Palazzo Judica and the Dome; and Scicli, a lovely town perched on a hilltop studded with extraordinary baroque palaces from the 18th Century such as Palazzo Beneventano, actually one of the most remarkable landmarks of the baroque Sicily, and the Church of San Giovanni Evangelista, with its peculiar convex façade. Beautiful squares, marvelous examples of the great work of the architects who were in charge of re-designing the town after the 1693 earthquake, include Piazza Italia, the widest one, and Piazza Busacca, one of the most noteworthy.